Air101: New airline is going to be a star! New airline is going to be a star! 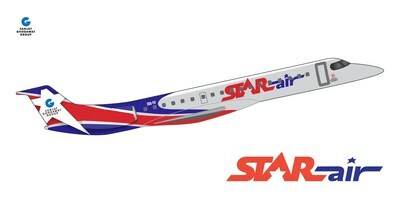 Star Air is a new scheduled commercial airline that aims to connect the real India and is promoted by Ghodawat Enterprises, part of the Sanjay Ghodawat Group. Star Air will target routes are where passengers are currently suffering a lot of transit layover delays and aims to provide a very reliable, safe and comfortable travel experience with direct connections. The airline will be headquartered in the Bangalore International Airport, "What we aim for is to create the right balance between a common man's pocket and the expectations which he holds from an airline," Capt. Simran Singh Tiwana, CEO of Star Air said, "In due course time, we aim to provide an all jet engine fleet connecting new city pairs," he added. Star Air will be introducing the Embraer ERJ-145 for the first time to the Indian commercial aviation sector and plans to start up with two aircraft initially, with steady expansion. Its first routes will be Hubli - Pune, Hubli - Hindon (Delhi) and Hubli - Tirupathi. The exact start date has not yet been agreed, however, Star Air expected to be taking off for the first time in mid-July 2018.